In my last week’s post, I wrote about my beginner’s journey into the world of herbal medicine and how to make a comfrey salve for your bumps and bruises. I hope that if you read last week’s post, you are feeling more empowered about your abilities to provide at least a portion of your own health care. As you continue down the path of creating your own herbal remedies, your confidence will grow and you can be assured that you will be providing some great natural healing resources for yourself and for those you care about. After making my first Elderberry-Echinacea syrup recently, I felt like, “Why haven’t I been making these things for years now?” Good question. Probably because I am finally discovering how simple it can actually be to make herbal remedies at home. I assure you that if I can make these things, you can too! If you already know how to cook, you can easily learn how to make herbal remedies as well. If you don’t already know how to cook, making these things are actually fairly simple, and it might even encourage you to start making a lot more things yourself at home. There is nothing to be afraid of. Just give it a shot! I searched online and found this excellent post and recipe for Echinacea-Elderberry Syrup from Crunchy Betty’s blog. All of the main ingredients, elderberries, echinacea, raw honey, cinnamon and ginger root, help to support your immune system or aid in healing your body when you have come down with one of those annoying seasonal infections. Crunchy Betty claims on her post that children can take this syrup as well as adults, but I cannot personally recommend a specific dose appropriate for children. The bottom line is that you should do your own research (or ask a health practitioner or professional herbalist) to determine whether this would be appropriate for your child. I do think that the syrup is certainly tasty enough that children wouldn’t mind taking it, however. Below are some pictures that I took while creating the syrup. I hope that you find them helpful. Again, if you would like to access the recipe that I used, please check out Crunchy Betty’s post. I’ve already taken this syrup several times when I felt like I was starting to come down with something. It is a very tasty way to take one’s medicine, indeed! *Note: Always consult with a qualified health practitioner to determine which natural therapies are right for you if you have any existing health conditions. All of the ingredients needed to make the syrup: spring water (you could use distilled water, but I used spring water from an excellent source near my house), ginger root (can be either fresh or dried), dried elderberries, cinnamon sticks, dried Echinacea (pictured above is Echinacea root that I purchased from the bulk herb section of my local natural food store, but you could also use the contents of an Echinacea tea bag if that is all that you have available), and some raw honey. You want to use raw honey, since only raw honey retains all of the healthy properties that honey should have such as enzymes. Getting organic local raw honey is best, if you can find some. All of the ingredients (except the honey, which is added later) ready to simmer in the pot. Pouring the finished liquid over a fine mesh stainless steel strainer into a glass measuring cup. The finished liquid, with a deep purple-red color. Be sure to press as much liquid out of the spent ingredients as you can to extract plenty of herbal goodness for your syrup! Once your liquid has cooled for about 10-15 minutes, add the liquid to the raw honey. This brief cooling period is very important, as the cooled liquid will not “cook” any of the raw goodness out of the honey. Stir this mixture well! Lastly, add your finished syrup to a very clean glass bottle, mason jar, or other glass container, label and use as needed. Store your syrup in the refrigerator, and enjoy your tasty creation whenever you feel like you could use an herbal immune boost. Smile when you reflect that you have an awesome herbal remedy at a fraction of the cost of a store bought version. Be careful, though: You may need to make extra when friends and family taste your new remedy and want some too! Better yet, teach them how to make some for their own family… Share the herbal love! 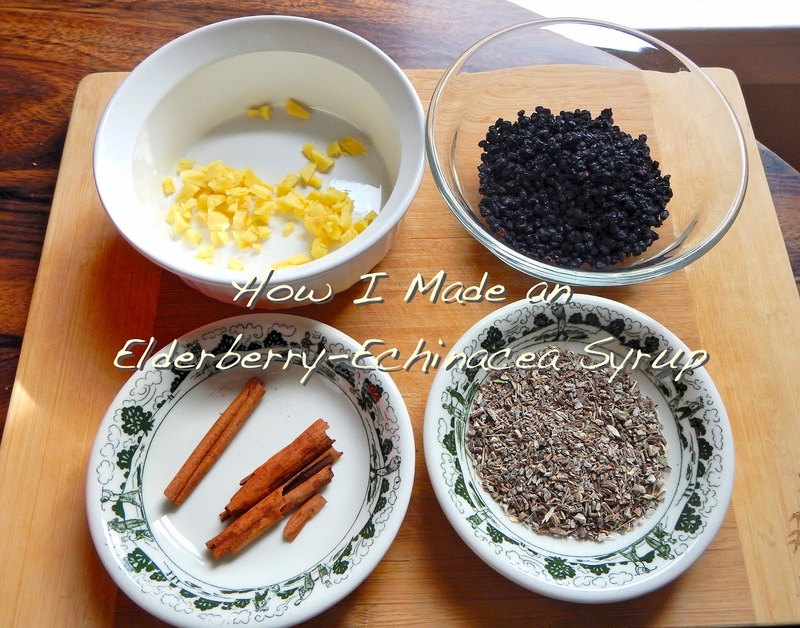 Your easy to follow tutorial makes creating elderberry-echinecea syrup at home look like a breeze! Thank you so much for sharing healthy natural remedy with us at the Healthy, Happy, Green and Natural Party Blog Hop. I appreciate it! Really good article. Eldenberry is a wonderful natural remedy, Thanks for sharing your recipe. I pinned and twitted. Visiting from Healthy Happy Green & Natural blog hop! Thanks so much, Marla! I hope that you have many healthy days ahead this fall and winter with your very own homemade elderberry syrup!